Officers Feared For Their Lives! Police in this university town say they hadn’t dealt with an emu on the loose before. So when the big bird was found running rampant, officers pulled out the big firepower. Cornered in a residential area Wednesday, the flightless cousin of the ostrich took five blasts from an officer’s shotgun before being finished off by three more rounds from a police rifle. Police say they had no other recourse in dealing with a species known to be aggressive and elusive — they’re capable of moving up to 35 mph — with anyone who gets too close. 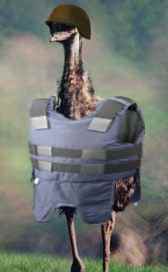 That might sound like a bit much, but when an emu comes to town in body armor, you know he’s only looking for trouble. He ain’t comin’ to drink, he ain’t comin’ to whore, he’s come to break an ostrich out of jail or something equally non-neighborly. Perhaps he backed up a little too quickly, and the police panicked to the tune of five shotgun shells and three rounds from a rifle, but let’s remember that these birds can weigh up to 130 pounds before the body armor and twenty-five pounds of M249 and ammo it likes to carry into college towns. Shouldn’t Carbondale have a SWAT team to handle emergency emu situations with automatic weapons? The newspaper story says that there was a shotgun and a rifle, but what if there were two rifles? Who was the second sniper? What did the emu know that the government had to kill him to keep him from squawking? Five shotgun blasts and three rounds from a rifle? The police didn’t just leave the emu lying there while they turned around and radioed it in, because when they turned back, the undead emu would be gone, leaving room for the sequel. Sure, you might be amused, but me, I am going to have emu nightmares tonight. That sounds like a clear case of suicide by cop.